Sometimes called the ‘Firecracker Plant’ Russelia equisetiformis is native to Mexico and comes in both red and yellow flowering forms. 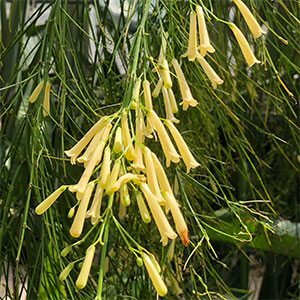 Best described as a multi branching shrubby perennial, it will reach to around 1 metre in height and with cascading or weeping foliage looks attractive year round. It is is summer when the plant flowers that it comes into its own, although in warmer climates it will flower almost year round. It will spread to around 2 metres over time and is best grown where it can be allowed to cascade over a low wall or embankment. It is also useful as a ground cover plant and can also be grown in containers and hanging baskets. Planted in a free draining humus rich soil Russelia equisetiformis will thrive. It grows best in a sunny position however will cope with some afternoon shade. In frost prone areas it is best grown in containers and given some protection. Fertilise with a general all purpose slow release fertiliser in spring as new growth commences. Deep watering is best allowing the soil to partially dry between waterings. In containers, and outdoors watering in winter should be cut back, especially in cooler climates. Propagation from stem cuttings taken in late spring is the preferred method of propagation. Russelia equisetiformis Lutea is the yellow flowering form. Two named varieties, Ruby Falls with its red flowers and Lemon Falls with yellow flowers are available. Both attract nectar seeking birds, bees and butterflies to the garden from spring right through summer. Old foliage can be pruned back to ground level as required. This will improve flowering and overall look. 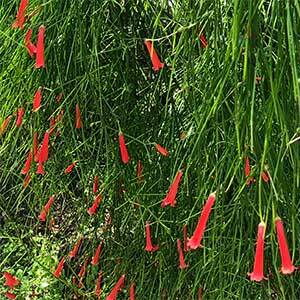 Common Name – ‘Firecracker Plant’ or ‘Coral Plant’. Spread – To 2m plus.